Mr. Deeds Goes to Town, Etc. 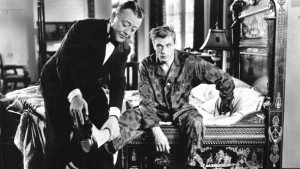 It gives me no pleasures to say it, but Frank Capra’s Mr. 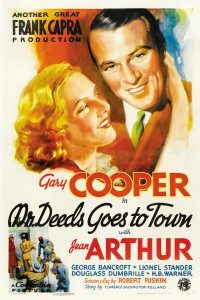 Deeds Goes to Town feels more like a comedy sketch spoof of an olde tyme film than a picture in its own right. I realize I’m supposed to be polite, and that American classics such as this rarely witness any public disrespect, but screw it: this film is cornier than my teeth after a barbeque. After inheriting a fortune, a yokel gets taken advantage of by big city sharks — including a foxy reporter — before he decides he’d be better off giving the money away. So it’s a screwball comedy, of a sort, but not of the sort of Capra’s It Happened One Night. That one’s actually vivacious and sassy. Deeds in contrast more often mopes along, making half-hearted feints at the funny. Setting up problems that feel more contrived than the politics in YA dystopias. The characters aren’t real and don’t behave like real people. The situation is writ so large as to be illegible. The conclusion might make sense emotionally, but logically it’s a muddle of epic proportions, like cleaning time at the vertical zoo. Naturally, Deeds was nominated for a slew of Oscars and it earned Capra his second Academy Award as Best Director. So, I suppose, in that way, it’s like Forest Gump, just older. A crowd pleaser you’re better off not thinking about too hard. Or at all. In general, it’s about sharing the wealth. In specific, I remain vastly unsure what it’s about. Not trusting people? Giving people second chances? Being satisfied with less? Letting yourself be a little weird? The picture’s one bright spot is Jean Arthur. She plays the calculating reporter Babe Bennett who succumbs to Deed’s charms — Longfellow Deeds being brought to some semblance of life by Gary Cooper. This was Arthur’s first leading role and surely the part didn’t feel as clichéd then as it does now? Mr. Deeds Goes to Town is the sort of film Sullivan’s Travels pokes fun at — and that film was made in 1946, only ten years later. While there’s nothing wrong with a little light distraction, Deeds failed to charm me for more than a moment here or there. Some of that might be attributed to the Great Depression being long ago replaced by whatever we’re going to call our current depression. 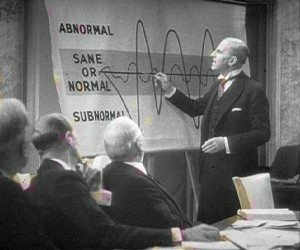 More might fall at the feet of the chatty, lethargic script which hasn’t aged well. And then, I suppose, part of it might be me: foolishly asking why a man with so many friends can fail to find one worth his trust; wondering how people of the day viewed justice if this courtroom finale passed for passable. Longfellow Deeds gives his money away to the poor farmers because they need it. It’s a noble gesture and part of what wins him Babe’s heart. But it’s also just a drop in the bucket. Deeds’ front hall is filled with men applying for free farmland — there are more of them just in his foyer than his millions will help. If only he had a true friend to counsel him. If only he stopped long enough to think about what he ought to do, and what he could do. If only he stood up, not only for himself, but against corruption. In the end, the evil, embezzling lawyers get a sock in the jaw, but no more. They dust themselves off and keep screwing us. And Deeds? He gets overwhelmed by the subjects of his generosity and, clothes torn, runs back to the courthouse where he finally claims his kiss. It’s wacky and gratifying but it undercuts everything else the film was attempting to say. If this were a film by Preston Sturges, that might be the final gag — the one that’s on us. But it’s a Frank Capra film and all it means to me is: feel good and get lost. People of the day loved Mr. Deeds Goes to Town. People today love it, too, I guess. But while I can watch It’s a Wonderful Life on hard repeat, this one was much too frothy. So feel good and get lost.